...I'd have no time for anything else. I don't know how those other bloggers do it. Oh, I'm delirious with happiness even though sequels and prequels to gargantuan self-contained epics are usually bad news. After all, more Bone is more Bone . 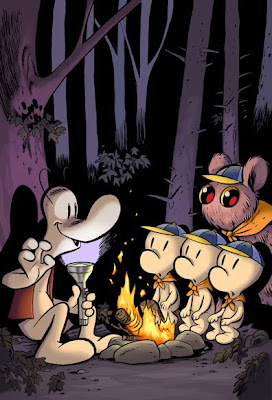 The first volume to be released will be Bone: Tall Tales, which will feature Smiley Bone telling stories to a group of Bone Scouts. The tales will include the existing prequel Stupid Stupid Rat-Tails , about the Bones' eponymous ancestor Big Johnson Bone. His tale is currently in black-and-white, but in the new version will be in color, along with two other Big Johnson Bone stories. The other tale in the collection is a "lost chapter" of Bone that originally appeared in Disney Adventures Magazine, but didn't make it into the final Bone compilation. This is presumably the same story that appears in full in The Art of Bone . 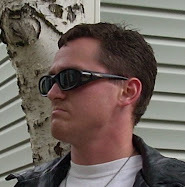 The other books coming out are a trilogy of novels written by Tom Sniegoski under the title Bone: Quest for the Spark, featuring a new set of Bones traveling to the Valley (don't Bones ever vacation anywhere else?). This is making it harder and harder for me to make my goal of one day reading the entire Bone saga from beginning to end in a single euphoric sitting. Before, I thought all I needed was the last remaining mini-comic, which comes with the Phoney Bone action figure, but now I see I need some additional volumes as well. I'd better stock up on beer, quiche, and hard, stuffed bread-thingies to sustain me during this reading task, which is looking increasingly arduous.